Features: Optional homepage layout, social icons, plain text mobile friendly "click" menu. Gallery page can be duplicated. Can be combined with other Minisite templates. 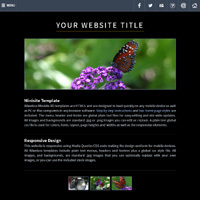 Details: HTML5, CSS3 JPG images, text or graphic header. Mobile, tablet and PC compliant, iPad, iPhone, Android, Galaxy, Windows Phone, etc. Basic HTML design with easy to replace .jpg and .png images. Text or graphic header, plain text menu. 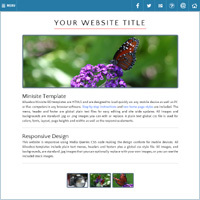 Web templates from any Minisite RD group can be combined for extra features. RWD (Responsive Web Design) HTML5 CSS3: Self contained downloadable HTML website. Includes dynamic photo gallery page with 18 images, can be copied to add more galleries. Step-by-step instructions and support included. Allwebco Minisites are HTML stand alone ad free downloadable HTML webpage templates. Works with any hosting company, compatible in all web browsers (IE, Firefox, Safari, Google Chrome, Opera, etc) and mobile devices (iPhone, iPad, Android, Windows Phone, etc). Minisites rate 99/100 at Pagespeed Insights and pass the Google Mobile Friendly Test as "Awesome". No graphics editing is required. Standard .jpg images, all stock photos and source files are included in the download. Includes a mobile friendly "click" menu. The menu is a plain text global file, links can be added and removed to customize the Minisite for your web development project. Can be combined with other Minisite RD websites. Media Queries css code is included with multiple "breakpoints" to allow the template webpages to conform for different device screens. Page images will stretch or stack to fit any device screen resolution. See What Are Responsive Templates for more details. All fonts colors and layout elements can be edited in the global css files. Can be edited using any plain text or HTML editing software. Our designs are complete HTML webpage templates and include multiple pre-formatted webpages. Pages are setup for common tasks like about, services, client list, site map and include dynamic pages like slideshows, video and photo galleries. Setup with built-in scripts and global css, our designs are built for SEO including meta, heading and image alt tags. Sites are created for fast browser load times so all our scripts are small and use very lean code. All colors and fonts can be globally edited. Any Allwebco Minisite is returnable within 30 days for a full refund. A free extended download service is included with each purchase. You can request a new download at any time including when a template has been updated. Minisites RD are exclusively sold on the Allwebco website and can not be purchased anywhere else.